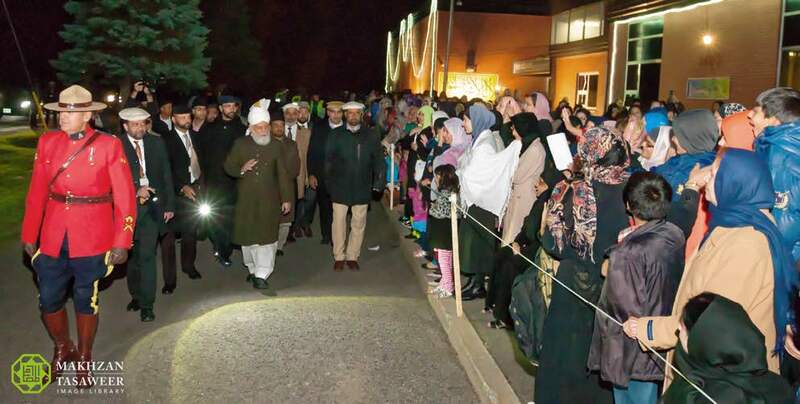 On 15 October 2016, the World Head of the Ahmadiyya Muslim Community, the Fifth Khalifa (Caliph), His Holiness, Hazrat Mirza Masroor Ahmad arrived in Canada’s capital city Ottawa. His Holiness arrived at the Baitul Naseer Mosque at 7.50pm where he was welcomed by hundreds of Ahmadi Muslim men, women and children all overjoyed at seeing their spiritual leader. Thereafter, His Holiness led the Maghreb and Isha prayers. During his visit to Ottawa, His Holiness is scheduled to deliver an historic address at Canada’s National Parliament and he will also hold meetings with Government Ministers, MPs and the media. His Holiness will also personally meet with hundreds of local Ahmadi Muslims. Earlier in the day, His Holiness departed from Peace Village, Ontario at 11.15am. On-route to Ottawa, His Holiness stopped in the city of Kingston, where members of the local Ahmadiyya Muslim Community gathered to greet him.